Recently I had a problem with the Google Analytics integration. There are several articles, which tell you how to send a unique id for your user session, but I just could not get it out. There were 2 things that I changed for the code to start working. I didn’t send the config file with ga(‘create’). It was like this: ga(‘create’, ‘UA-*****’, ‘auto‘); Auto is wrong. Use your custom config to pass the user id. I even tried with ga.set(‘userId’, userId ) but it still didn’t work. I was setting the dimensions before calling ga(‘create’). I don’t know if this is a real problem, but after I moved the dimensions I started receiving them. You should care when you send your dimensions. It is not necessary to use document.ready to send the analytics data. You can just move it out of document.ready. You mst create a UserID view to display the userIds. It will be suggested to you at the last step of enabling the UserId tracking. Google Analytics (GA) reports contain two types of data: dimensions and metrics. GA, display data in its reports usually in the form of a table. Every Google Analytics report is made up of dimensions and metrics. What is Dimension in Google Analytics? A dimension is the attribute of visitors to your website. For example let’s say a man aged between 25-34 from ‘London’ visited your website after clicking on an organic search listing on Google which he found by searching for the keyword ‘attribution modelling’. Let us also assume that he visited your website via a chrome browser which is installed on a desktop computer which run windows. Gender, Age, City, Source /Medium, Keyword, Browser, Device Category and Operating System are all labelled as dimensions in Google Analytics because they are the characteristics of your website users. What is metric in Google Analytics? Metric is a number which is used to measure one of the characteristics of a dimension. A dimension can have one or more characteristics. Sessions, % New Sessions, New Users, Bounce Rate, Pages / Sessions etc are all labelled as metrics in Google Analytics because they are the characteristics of the dimension called ‘Source / Medium’. Though both dimensions and metrics are the characteristics of your website visitors, they are different in the way they are: configured, collected, processed, reported and queried in Google Analytics. For example, you can’t use (or query) dimension as a metric or metric as a dimension in Google Analytics either via the reporting interface or via API. A dimension provides context to a metric. Consequently a standalone metric is meaningless to analyze and report. For example the metric ‘sessions’ is meaningless on its own and make sense only when used together with a dimension like ‘source/medium’, ‘user type’, ‘country’ etc. Conversions – how visitors completed conversions on your website. Unlike dimensions, not all metrics can appear in every Google Analytics reports. For example ‘page value’ metric appear in only certain Google Analytics reports. This is because Google Analytics uses different analytics attribution models (not to be confused with attribution models used in multi-channel funnels) to produce certain set of reports or to produce certain set of metrics. #1 Per GIF request attribution model – This model is used to calculate aggregate values for a metric. #2 Page value attribution model (or forward looking attribution model) – This model is used to calculate ‘page value’ metric for a page or set of pages. #3 Site search attribution model – This model is used to calculate Goal value and Goal conversion rate for each search term. A dimension can have any of the following scopes: ‘Hit’, ‘Session’, ‘User’ or ‘Product’. Whereas a metric can have only two scopes, either ‘Hit’ or ‘Product’ (more about scopes later). The value of a custom dimension is of type ‘text’. Whereas value of a custom metric is of type ‘integer’. 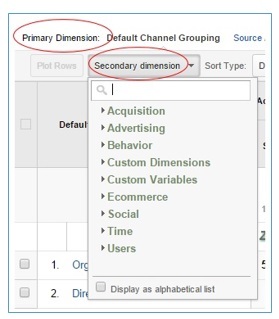 Predefined dimensions are the one which are already available in Google Analytics reports. They are ready to use dimensions. Custom dimensions are user defined dimensions. If you want to measure the characteristic of a user which can not be measured by any predefined dimension then you need to create and use your own dimension to measure such characteristics. For example you can create your own dimension to determine and store keywords which resulted in a phone call on your website. Similarly, you can create your own dimension to retrieve website usage data by authors, logged in or logged out users or create your own dimension to measure conversion data and time in Google Analytics. Through custom dimensions you can import the data which google analytics does not automatically collect (like CRM data, phone call data, logged in users data etc) and correlate this non-google analytics data with Google Analytics data. Both predefined dimensions and custom dimensions can be used as primary dimension or secondary dimension in GA reports: You can use custom dimension as primary dimension in custom reports or as a secondary dimension in standard reports. But you can’t use custom dimensions as primary dimension in standard reports. By default you can add only two dimensions to a GA report at a time: one primary dimension and one secondary dimension. Step-1: Create a new custom report. This can help you in doing more meaningful analysis. Note: You can also use custom dimension as an advanced segment in GA reports. Name is the name of the custom dimension as it will appear in your Google Analytics reports. Use a descriptive and unique name so that you can easily identify and understand the functionality of your custom dimension. Index (also known as slot) is a number (must be a positive integer) which is used to internally identify and differentiate one custom dimension from another in Google Analytics. Index is like a parking space reserved for your custom dimension. So once an index is used, it can not be used for another custom dimension. The value of index should be between 1 and 200. Scope determines the hits that will be associated with the value of a custom dimension. Last Changed is the date when a custom dimension was first created or last modified. State is the current status of a custom dimension. It can be either ‘active’ or ‘inactive’. Note: Inactive custom dimensions may continue to appear in your reports but you will not see any new value in reports. A hit is a user’s interaction with your website/app that results in data being sent to the Google Analytics server. A user can send one or more hits. Value of a custom dimension is sent along with a hit. So if a custom dimension has been set up, then a user hit is sent along with the value of custom dimension. Otherwise the hit is sent without the value of custom dimension. When a user hit is sent along with the value of custom dimension and the custom dimension has got hit level scope, then the value of custom dimension is only applied to the hit with which the value was sent. In other words, the value of custom dimension is calculated and send for each hit. A session is a group of hits recorded for a user in a given time period. A user can trigger one or more sessions on the same day or over the course of multiple days, weeks or months. By default a session expires after 30 minutes of users’ inactivity on your website or at midnight or if the user return to your website via a different campaign. When a custom dimension has got session level scope, its value is applied to all the hits in a current session. In other words, the value of custom dimension is calculated and send only once per session. To learn more about sessions in Google Analytics, check out this article: Understanding sessions in Google Analytics. A user is a random unique client ID set by Google Analytics cookie when a browser (like chrome, internet explorer, safari etc) loads your website content for the first time. Every time a new client ID is detected in a session, Google Analytics count it is as a new user. Every time an existing client ID is detected in a new session, Google Analytics count it as a returning user. Since a client ID exist only on the device (desktop, laptop, mobile, tablet) and the browser where it has been set, Google Analytics can not identify a user across devices and browsers. 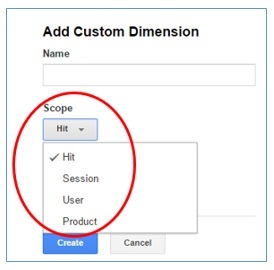 When a custom dimension has got user level scope, its value is applied to all the hits in the current session as well as future sessions of a user, until there is a change in value of custom dimension or custom dimension has been made inactive. In other words, the value of custom dimension is calculated and send only once per user. To learn more about users in Google Analytics, check out this article: Understanding users in Google Analytics. A product represents the product you sell on your website. When a custom dimension has got product level scope, its value is applied to the product for which it has been set. In other words, the value of custom dimension is calculated and send only once per product. Product level scope can be set for custom dimensions only when you have implemented enhanced ecommerce tracking on the website. #1 if a custom dimension has got a hit scope, then the value of custom dimension should be calculated and send for each hit or for the hit with which the value is sent. #2 if a custom dimension has got a session scope, then the value of custom dimension should be calculated and send only once per session. #3 if a custom dimension has got a user scope, then the value of custom dimension should be calculated and send only once per user. #4 if a custom dimension has got a product scope, then the value of custom dimension should be calculated and send only once per product. It is the dimension which has got hit level scope. A hit level dimension can be predefined or custom. #2 The dimension value change for each hit. In case of hit level custom dimension, the value of custom dimension is calculated and send for each hit. It is the dimension which has got session level scope. A Session level dimension can be predefined or custom. #2 The dimension value doesn’t change often for each hit. In case of session level custom dimension, the value of custom dimension is calculated and send only once per session. Note: Session level custom dimensions can be set at any time during a session. It is the dimension which has got user level scope. A User level dimension can be predefined or custom. #1 You want to associate the custom dimension value with all the hits of current and future sessions of a user. #2 The dimension value doesn’t change often for a particular user, until there is a change in value of custom dimension or custom dimension has been made inactive. In case of User level custom dimension, the value of custom dimension is calculated and send only once per user. It is the dimension which has got product level scope. A Product level dimension can be predefined or custom. #1 You want to associate the custom dimension value with a particular product. #2 The dimension value change for each product. For example product name change with each product. 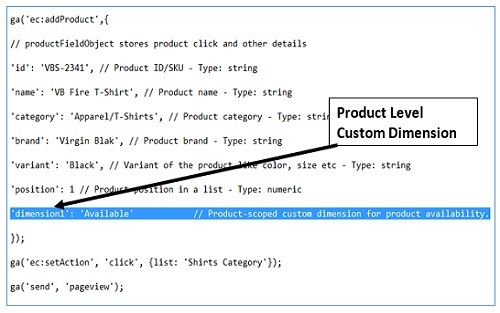 In case of Product level custom dimension, the value of custom dimension is calculated and send only once per product. You can send the value of a Product level custom dimension only with enhanced ecommerce product data. Predefined metrics are the one which are already available in Google Analytics reports. They are ready to use metrics. Custom metrics are user defined metrics. If you want to measure the characteristic of a dimension (whether predefined or custom dimension) which cannot be measured by any predefined metric then you need to create and use your own metric to measure such characteristics. 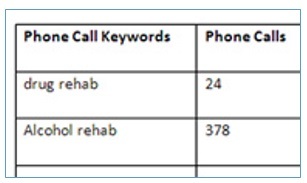 If you have defined the keywords which resulted in a phone call as a custom dimension in GA then one of the characteristics of this dimension could be, number of phone calls generated by each keyword. We can measure this characteristics of the custom dimension by creating and using a custom metric say ‘Phone Calls’. Through custom metrics you can import the data which google analytics does not automatically collect (like CRM data, phone call data, logged in users data etc) and correlate this data with Google Analytics data. You can use custom metrics with both predefined dimensions and custom dimensions. Note: Google Analytics provide more than 200 predefined dimensions and metrics. You can get the entire list from here. Name is the name of the custom metric as it will appear in your Google Analytics reports. Use a descriptive and unique name so that you can easily identify and understand the functionality of your custom metric. Index (also known as slot) is a number (positive integer) which is used to internally identify and differentiate one custom metric from another in Google Analytics. It is like a parking space reserved for your custom metric. You can not use same index for two or more metrics. The value of index should be between 1 and 200. Scope determines the hits that will be associated with the value of a custom metric. Integer is a whole number. Currency is a decimal number. Last Changed is the date when a custom metric was first created or last modified. State is the current status of a custom metric. It can be either ‘active’ or ‘inactive’. Note: Inactive custom metrics may continue to appear in your reports but you will not see any new value in reports. Minimum Value is the minimum value of a custom metric that should be processed and displayed in your reports. Maximum Value is the maximum value of a custom metric that should be processed and displayed in your reports. When a custom metric has got hit level scope, then the value of custom metric is only applied to the hit with which the value was sent. In other words, the value of custom metric is calculated and send for each hit. When a custom metric has got product level scope, its value is applied to the product for which it has been set. Product level scope can be set for custom metrics only when you have implemented enhanced ecommerce tracking on the website. It is the metric which has got hit level scope. A hit level metric can be predefined or custom. #2 The metric value change with each hit. In case of hit level custom metric, the value of custom metric is calculated and send for each hit. It is the metric which has got product level scope. A Product level metric can be predefined or custom. #2 The metric value change for each product. For example ‘product colour’ often change with each product. In case of Product level custom metric, the value of custom metric is calculated and send only once per product. You can send the value of a Product level custom metric only with enhanced ecommerce product data. Not all dimensions and metrics can be queried / used together. Only those dimensions and metrics can be used / queried together which have got the same scope. Therefore we can have valid and invalid dimension-metric combinations. ‘user type’ and ‘users’ is a valid dimension-metric combination because both the dimension and metric have got the same user level scope. ‘source’ and ‘users’ is an invalid dimension-metric combination because both the dimension and metric have got different scope. The dimension ‘source’ has got session level scope whereas the metric ‘users’ has got user level scope. Similarly, ‘page’ and ‘users’ is an invalid dimension-metric combination because the dimension ‘page’ has got hit level scope whereas the metric ‘users’ has got user level scope. Note: hit level scope is also knowns as ‘action’ level scope. 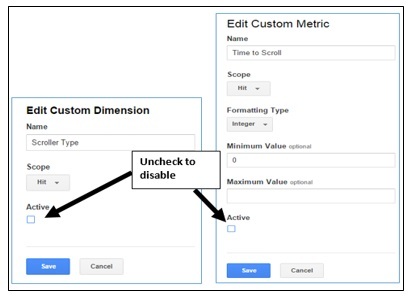 #1 Custom dimensions and metrics can be set up only in Universal Analytics and not in classic Google Analytics. #2 In classic Google Analytics we use custom variables instead of custom dimensions. #3 Both custom dimensions and custom metrics are set at the property level and not at a view level. #4 You can create up to 20 custom dimensions and 20 custom metrics per property in Universal Analytics. #5 If you are using Google Analytics Premium then you can create up to 200 custom dimensions and 200 custom metrics per property. 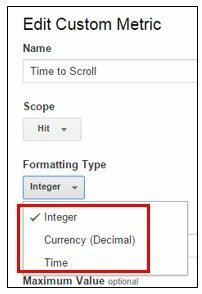 #6 Once you have setup a custom dimension or custom metric in your GA property, you can’t delete it. However you can edit it. #8 Google recommends not to re-use/edit (i.e. change name, scope etc) a custom dimension or custom metric as it can create data integrity issues which can’t be easily fixed. So setup custom dimensions/metrics after a proper thought and planning. #9 The values of custom dimensions (with hit,session or user scope) and custom metrics (with hit scope) are sent to Google Analytics as parameters attached to other hits (like pageviews, events etc). Consequently values of custom dimensions and custom metrics can’t be sent after a hit has already been sent. #10 The values of custom dimensions and custom metrics with product level scope are sent to Google Analytics as parameters attached to a product data. Consequently values of custom dimensions and custom metrics can’t be sent after after the product data has already been sent. #1 Planning – at this stage you create a road map of exactly how you will collect the data and send it to Google Analytics via custom dimensions / metrics. 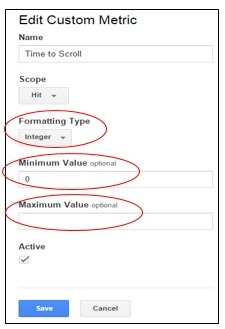 #2 Configuration – at this stage custom dimensions and metrics are defined via Google Analytics property settings or GTM container tag settings. #3 Collection – at this stage you collect the required data (like values of custom dimensions or metrics) from your implementation and then send it to Google Analytics server. #4 Processing – at this stage GA server process the collected data according to their configuration values (like scope) and reporting view filters. #5 Reporting – at this stage the processed data become available in the GA reports. #6 Querying – at this stage a GA user can query the data either via the reporting interface or via the GA API. I have explained all of these stages along with examples in great detail in the article: How to correctly measure Conversion Date & Time in Google Analytics. How to replace mixins in React? Kostadin Golev on The ultimate machine (PC, laptop or Mac) to buy for programming?